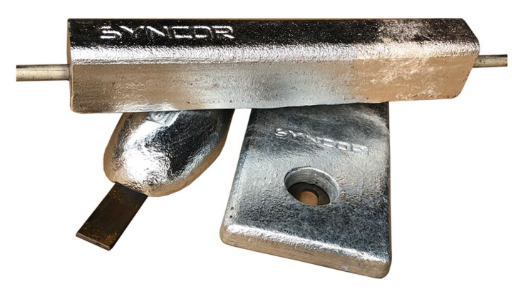 Zinc Anodes_Cathodic Protection | Syncor Cathodic Protection Co. Ltd.
Zinc based anodes are widely used for shipping applications, they are also used for offshore structures but their higher density can lead to weight limitations. Zinc anodes do not require a chloride environment to operate and can be used in brackish and fresh water applications with resistivity up to 30 Ohm*m.
There is a wide range of alloy compositions available. Our Zinc anodes are subject of National and/or International Patents. The different compositions are intended to optimize specific performance properties. The electrochemical properties for zinc based alloys will vary depending on the specific alloy composition and the operating environment. Cathodic protection of ships and other marine metallic structures.Generally, zinc alloys are only applicable at temperatures up to 50 °C. Above this temperature, zinc alloys can suffer from inter-granular corrosion, especially when buried in saline mud. Also restrictions impose and where pH is over 8. Under these situations, zinc becomes Cathodic, rather than anodic, and should be avoided. Syncor develop a Zinc alloy that can operate successfully at higher temperatures up to 85 °C.